UPDATE: As of Monday night, my previous forecast below remains the same. 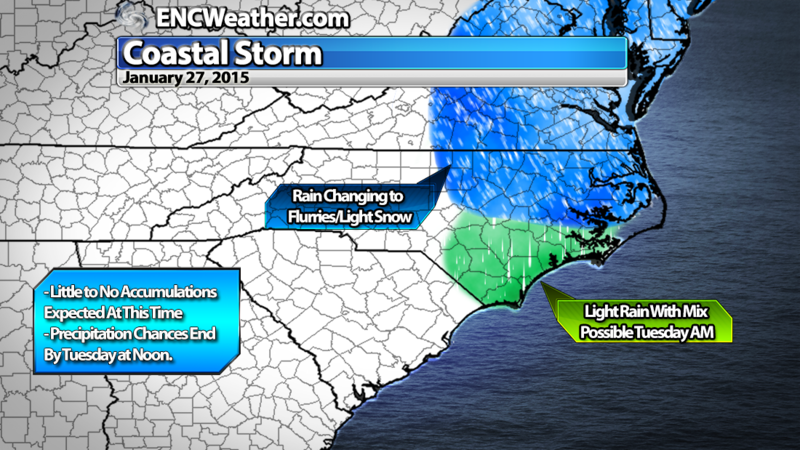 The area that will see the best chance of snow will be the northeastern section of ENC. 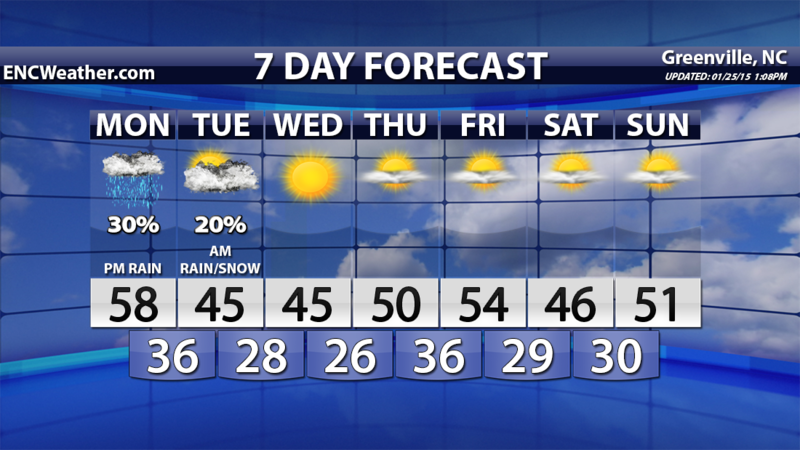 With surface temperatures and ground temperatures remaining above freezing, no accumulations are expected at this time. Some areas over the northern half of ENC could see light snow showers/flurries but do not expect more than that. Blizzard warnings are being issued for coastal sections of the northeast CONUS as residence to the north prepare for a strong winter storm to approach Tuesday. This predicted storm will form from a “clipper” system currently over Kentucky. As the clipper begins to approach Virginia, a low pressure center will form off the North Carolina and become the parent low (this process is also referred to as a “Miller Type-B Cyclogenesis”). As this occurs, the upper-level trough will become negatively tilted as a strong jet streak rounds the base of the trough. This surface low will develop on the left exit region on the southern jet streak and the right entrance of the northern jet streak. Add a strong vort max at the base of the trough and you get the ingredients to a rapidly deepening low off the US Coast. Strong CAA will accompany this low setting the stage for a nor’easter storm that will bring heavy amounts of snow to the northeastern states. The surface low will lie in the sweet-spot of two jet streaks off the east coast. Strong mid-level vort max at the base of the trough contributing to the upper-level divergence. The clipper will approach the area early Monday morning when the surface low will develop off our coast. Doesn’t look like there will be a lot of moisture with the approach of the clipper and the transfer to the new surface low so I only expect isolated showers close to the coast through the early morning hours. By Monday afternoon, the surface low will begin to deepen rapidly as it begins to pull away from our coast. During the afternoon, most of the area will remain in a dry slot so rain chances decrease during this time. The models have been hinting at some wrap-around moisture will occur on the back side of the low potentially making it into ENC by Monday evening. How much moisture is uncertain at this time and remains a tough call forecast-wise. What I try to be careful with (something that I have learned from experience in ENC) is the moisture going to fall in a dry environment (during cold air advection) and nothing reaches the ground or will temperatures actually support frozen precipitation at the time the moisture does reach ENC. If enough moisture is in place, I would expect rain to be the primary precipitation type all day Monday with a mix towards midnight and potentially changing over to flurries/light snow early Tuesday morning. Given marginal surface temperatures, the best bet for locations seeing snow would be the northern sections where cold air will be more abundant. The areas with the best chance of seeing any accumulation (be it very small) would be the far northeastern section of ENC and northern Coastal Banks. Of course this forecast could change prior to the event so make sure to keep up with the latest information here or your local media. Current thinking for precipitation type chances for Tuesday morning. Little to no accumulations. This graphic shows what precipitation could fall as if precipitation were to fall at that location. Given the scattered nature it is unlikely everyone in the shaded area will see precipitation at all Tuesday morning. As the surface low continues to depart Tuesday afternoon, precipitation chances will end from southwest to northeast as dry air returns to ENC.